This is my first response to a TSQL Tuesday. 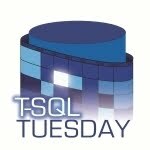 There are lot of things in TSQL that can be done to make DBA’s life easier. We have a large collection of scripts. These are some I have used over the years at multiple jobs – there are several more but I don’t particularly want to write a very long post. Also a disclaimer that I did not write all of them. I wrote some, I tweaked some I found on sites like SQLServerCentral.com that have come in very handy. I apologize ahead for not offering credit since I have not kept track of the authors. I hope you all find something useful. And thank you to Allen White for hosting.